Each of us has suffered a restless night at some point in our lives. We’ve all occasionally sacrificed sleep for a cram session before an exam, or an important deadline. Many of us also know the feeling of losing sleep due to an intense emotional upset or the accumulation of stress or anxiety. For some of us, loss of sleep is short-lived; for others, it is chronic and we’ve come to anticipate losing sleep on a regular basis. Insomnia can be caused by elevated or chronic stress, illness, physical discomfort, environmental factors, changes in our schedules, side effects from prescribed medications, depression, anxiety, and many other factors.1 Insomnia can also be an indicator of a more serious health problem. So if you have not already, please consult with your primary healthcare provider about your difficulty sleeping. Regardless of its origins, losing sleep is hard on our bodies and can be difficult to cope with—even at the acute level. When sleep loss becomes a regular occurrence, it tends to trap us in a vicious downward spiral that can have far-reaching effects on our well-being. We’re exhausted, we’re taxed mentally, physically, and emotionally, and our judgment is often painfully impaired. We want nothing more than to sleep, but we’re often afraid that we won’t be able to. And unfortunately, the fear itself can compound anxiety and stress, further inhibiting our ability to surrender to sleep. Our bodies crave sleep for good reason and there are actually serious health risks associated with sleep loss, which can have complicated effects on both the physiology and the mind. Negatively affects our moods and emotions. Increases the risk of accidents. Impairs cognitive ability (dumbs us down). Increases incidence of depression (by five times that of the normal population). Accelerates aging in the skin. May cause weight gain and obesity (and makes losing weight more difficult). Is linked to diabetes, cardiovascular disease, and early mortality. Increases the risk of death. Whether you have difficulty falling asleep or staying asleep, sleep loss can feel maddening, debilitating, and sound sleep can seem further out of reach with each restless night. But there is hope. 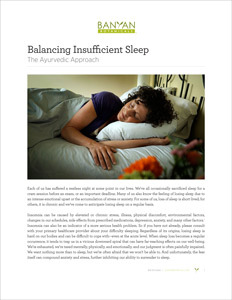 Actually, supporting your body to return to a balanced sleep cycle might not be as difficult as you imagine it to be. And Ayurveda offers time-tested tools that truly support our bodies in reclaiming their natural rhythms. So, let’s take a break from the fretful anticipation of sleeplessness that so often accompanies insomnia and instead focus on real and meaningful tools for balancing our sleep cycles. When it comes to insomnia, either vata or pitta is usually involved in the imbalance (and sometimes both). Pitta typically interferes with our ability to fall asleep while vata tends to cause interrupted sleep, and a tendency to awaken without being able to return to sleep. But it is equally important to understand which of the twenty gunas (or qualities) are involved in the imbalance. We can intuitively understand that sleep requires a certain heaviness, stillness, and a distinctive quieting of the mind; these are the qualities that support our bodies in being able to surrender to sleep. Vata and pitta however, naturally share elements of the light, mobile, subtle and clear qualities—all of which oppose and counteract the very energies necessary for sound sleep. Further, both vata and pitta tend to trigger upward moving energy in the body whereas sleep is supported by downward moving energy. Therefore, when excess vata or pitta are active just before (or at any point during) the sleep cycle, they can leave us feeling active, mentally alert, especially sensitive to subtle changes in our environment, utterly preoccupied with racing—or even well-organized—thoughts, and we become prone to insomnia. While there are certainly subtle differences between vata and pitta types of insomnia, the two do not require entirely different treatment strategies. In fact, it can be very clarifying to understand the universal patterns and, where appropriate, to highlight the nuanced variations in correcting one or the other type of insomnia. Whether it is caused by vata, pitta, or a combination of the two, the Ayurvedic approach to balancing insomnia is largely focused on helping the system to return to balance by opposing any sleep-disrupting influences with their opposites. But simultaneously, we must support the body’s natural circadian rhythms, while quieting the nervous system in the interest of reducing stress and returning to a healthier baseline state of calm. Ultimately, the goal is to foster a natural and easeful transition into sleep, and to be able to maintain that state until the body is fully rested. The following recommendations work to balance sleep cycles by quieting and grounding the mind, emphasizing the heavy, slow, and stable qualities in ways that specifically support sleep, embracing a daily routine that awakens our natural biological rhythms, and by reducing stress and tension in the mind and body. These strategies subdue the excess lightness, clarity, subtlety, mobility, and upward movement that so often interfere with balanced sleep. It is also important to tend to agni (the metabolic fire), which Ayurveda recognizes as the foundation of optimal health. Many of the strategies below naturally support agni and help to clear toxins—emotional and otherwise. For more detailed information on agni and how to care for it in your system, see our resource on The Importance of Healthy Digestion. Encouraging a sense of consistency in our rhythms and routines fosters a certain stability that is not only grounding, but is also deeply reassuring to the nervous system. In the context of the fast-paced modern world where stress and anxiety run rampant, a routine provides an important foundational level of support for a calmer mind, a more relaxed nervous system, and better sleep. It also helps us to align with the natural rhythms of the day, and offers a certain predictability that is very supportive of our physiology. In fact, Ayurveda emphasizes the importance of a daily routine for everyone, though its content may vary based on one’s constitution, current state of health, age, and environment. If this concept is new to you, you might appreciate exploring our Daily Routine Department. If you don’t have a routine and just want to start with the basics, consider committing to a consistent bedtime and wake time (even on the weekends). If you’re feeling even more ambitious, try to eat your meals at the same time each day. If your work schedule varies, you can also try to maintain more consistent work hours from one day to the next. Of course, certain times of day have a more direct impact on our sleep cycle, namely those periods on either side of sleep—just prior to bed and immediately after waking. Observing specific practices at these times of day can be instrumental in supporting sound sleep. A bath relaxes the nervous system, releases tension, and helps to quiet the mind. Use hot water for vata, warm water for pitta. Having a cup of boiled milk or chamomile tea. These drinks are grounding and soothing in nature. If you like, add a pinch of nutmeg, cardamom, and some ghee to the milk. Massaging your feet and scalp with warm oil. This practice is grounding, supports downward moving energy, and helps to soothe the mind. If you massage your scalp, be sure use a towel or some other means of protecting your pillow from the oil. Sleep Easy Oil is balancing for vata and pitta; it helps to calm the mind and soothe the nervous system in support of healthy sleep patterns, deep rest, and improved relaxation. Sesame Oil, and Vata Massage Oil are also good for vata. And for pitta, Sunflower Oil, and Pitta Massage Oil are great choices, too. Abhyanga (Ayurvedic self-massage with oil). This practice is very grounding and nurturing. It helps to calm the nervous system and is a very potent practice of self-love. For more information and for help determining which oils would be best for you at this time, please see our resource on Ayurvedic Self-Massage. A morning routine that sets a calm and clarifying tone for the new day. Supportive practices might include a morning shower, a gentle morning walk, or a few minutes of meditation, yoga, or pranayama. Eliminate screen time in the evening. Screen time of any kind is incredibly disruptive to the biological rhythms that support sleep. If you are serious about improving sleep, it is best to limit or eliminate screen time from the hours immediately before you sleep—ideally from dinner onward. In much the same way, stimulants such as caffeine, nicotine, and alcohol tend to disrupt physiological cycles essential to sound sleep.5 When struggling with insufficient sleep, it is best to eliminate them entirely (or as much as possible) from your lifestyle. Reading before bed is very stimulating—especially to the eyes and the mind—is particularly pitta-provoking, and can interfere with sound sleep. It is best to avoid reading in bed, and you might consider eliminating reading from your evening routine altogether. Eat a wholesome dinner early in the evening. A heavy dinner can interfere with our ability to sleep.6 The best evening meals are healthy, nourishing, easily digestible, and are eaten at least three hours prior to retiring to bed. What If I Can’t Sleep? If you find yourself unable to sleep, it is better to get up than to force yourself to stay in bed. We want to learn to associate bed with restful sleep, not with the struggle to beat insomnia. For some, getting up and making a to-do list helps to clear the preoccupations of the mind and can be very helpful. If you find this to be the case, get in the habit of making the list before you go to bed each night. For others, a cup of tea or hot milk will do the trick. Still others enjoy taking a little time for a grounding meditation or pranayama practice (yogic breathing exercises). You’ll find what works for you, but only return to bed when you feel sleepy and genuinely ready to surrender to sleep. Exercise serves the body in many different ways, provided it is done at an appropriate intensity for your constitution and current state of balance. Exercise kindles agni (which is essential to optimal health), improves digestion, bolsters the body’s detoxification mechanisms, encourages proper elimination, promotes relaxation in the body, and supports sound sleep.7 However, improper exercise can disturb sleep. For instance, exercising too close to bedtime can be overly stimulating.8 Ayurveda says that the best times of day to exercise are from 6–10 a.m./p.m. However, in cases of insomnia, an evening workout should be completed at least two to three hours before bedtime.9 Vata and pitta actually have somewhat different needs when it comes to exercise, so it is also important to choose an activity regimen that is appropriate for your particular imbalances. Make sure that your exercise routine is not overly stimulating, but gentle and grounding instead. Favor activities like walking, hiking, gentle cycling, yoga, or chi gong. If you practice yoga, practice vata-pacifying yoga or a handful of slow and purposeful Sun Salutations each morning. Make sure that exercise is not overly intense, but do it with relaxed effort instead. Enjoy activities like walking, hiking, light jogging, swimming, cycling or yoga in the morning or evening (when it is coolest), and try to breathe through your nose the entire time. If you practice yoga, practice pitta-pacifying yoga or a series of gently-paced and purposeful Moon Salutations each morning. Because stress is so often a factor in disturbed sleep cycles, it is imperative that we reduce our exposure to stress wherever possible.  That said, chronic stress tends to ramp up the stress response so that our bodies react to even benign situations as if they were profoundly threatening.10 Ayurveda recommends a number of subtle therapies like meditation, pranayama, and yoga as an effective means of breaking this cycle, resetting the nervous system, and cultivating a healthier physiological response to stress. If you would like more in-depth support, please see our health guide on the topic, An Ayurvedic Guide to Stress Management. If you do not have a meditation practice, something simple like Empty Bowl Meditation is a great place to start. Full Yogic Breath, Ujjayi, Nadi Shodhana, and Bhramari are especially supportive of the mind, the nervous system, and sleep. Most of these should be practiced on an empty stomach. The early morning is often an ideal time. Even five to fifteen minutes of pranayama daily can have a profound effect on our experience of stress and our overall state of mind. In addition, a few minutes of Bhramari in the evening can help to settle the system and encourage sound sleep. A gentle grounding practice will typically be best for countering insomnia. If vata is the main issue, favor vata-pacifying yoga. If pitta is the predominant force in your imbalance, pitta-pacifying yoga will be best. In either case, practice during the morning will help to set the tone for a more easeful day. Any practice done in the evening should be as gentle and quieting as possible. Favor restorative poses at this time. There are a number of Ayurvedic herbs that can help to balance vata and pitta, encouraging healthier sleep patterns. Some bolster the nervous system, others encourage an improved relationship with stress, some reduce excess vata or pitta throughout the system, and still others help to promote that grounding, downward moving energy that is so essential to sound sleep. I Sleep Soundly is a formula specifically designed to support sound sleep. These tablets help the muscles to fully relax so that the body can physically surrender to sleep. At the same time, this formula helps to soothe the mind and nervous system in support of quality sleep. Brahmi/Gotu Kola is incredibly sattvic in nature and is renowned for its ability to support the nervous system and the mind. It is a cooling, relaxing tonic for pitta and it helps to calm vata in the mind. Brahmi/Gotu Kola liquid extract is also available. Ashwagandha has long been revered for its ability to support the body in resisting stress while calming the mind. As a highly regarded adaptogen, Ashwagandha supports quality energy throughout the day and sound sleep at night. Ashwagandha tablets and liquid extract are also available. Healthy Vata tablets help to balance vata throughout the system, supporting overall health and well-being. Vata Digest tablets help to remove excess vata from the digestive tract in support of agni, which is essential to optimal health. If you prefer a powder, Hingvastak is the powdered form of this formula; it can be taken alone or sprinkled on your food like pepper. Healthy Pitta tablets help to balance pitta throughout the system, supporting overall health and well-being. Pitta Digest tablets help to remove excess pitta from the digestive tract in support of agni, which is essential to optimal health. If you prefer a powder, Avipattikar powder is a traditional Ayurvedic formula with very similar qualities and effects. While Ayurveda offers a number of effective tools for balancing insomnia, working with an Ayurvedic practitioner can be incredibly clarifying and can help to focus therapeutic efforts where they will deliver the best results for your particular situation. That said, the above remedies provide a solid foundation for anyone struggling with sleep deprivation. While insomnia can certainly be a frustrating and debilitating condition to live with, the Ayurvedic tradition offers a very holistic approach to finding balance. As with most ailments, when we address the deeper context of our lives and begin to correct the root cause of our imbalances, we are inevitably taking profound steps toward improved overall health and wellness. We sincerely hope that we can continue to support you in finding your way to sound sleep and vibrant health. Sleep! The most reputed beauty tip there is. Of course, they don’t call it “beauty sleep” for nothing. 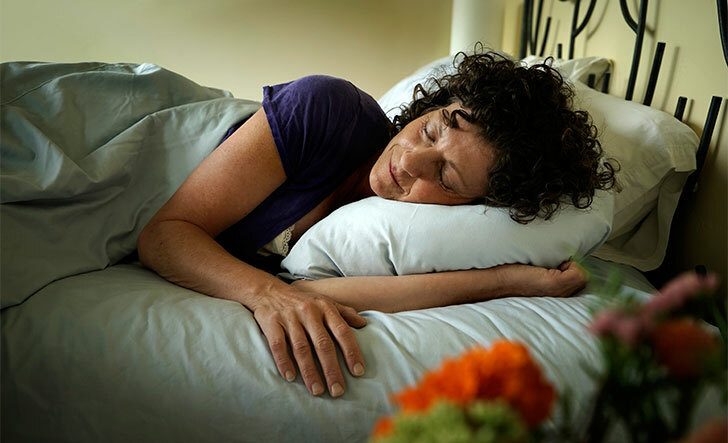 Modern science has determined adequate sleep to play a crucial role in the repair and rejuvenation of the tissues—both inside and outside of the body. Making the time for appropriate sleep is also an act of self-care. We all know the value of sleep. Perhaps more importantly, at some point in our lives we’ve endured the consequences of not getting enough sleep. Both the quality and quantity of sleep play into our moods, hormones, organ restoration, and energy levels. 1 “An Overview of Insomnia,” Web MD, last modified 29 Jul, 2012, http://www.webmd.com/sleep-disorders/guide/insomnia-symptoms-and-causes. 2 Camille Peri, “Coping With Excessive Sleepiness: 10 Things to Hate About Sleep Loss.” Web MD, last modified 13 Feb, 2014, http://www.webmd.com/sleep-disorders/excessive-sleepiness-10/10-results-sleep-loss; “Consequences of Insufficient Sleep,” Healthy Sleep (Harvard Medical School: Division of Sleep Medicine), last modified 18 Dec. 2007, http://healthysleep.med.harvard.edu/healthy/matters/benefits-of-sleep/why-do-we-sleep. 3 Vasant Lad, The Complete Book of Ayurvedic Home Remedies (New York: Three Rivers Press, 1998), 211–12. 4 “Overview of Insomnia,” Web MD. 5 “Slideshow: Insomnia Myths and Facts.” Web MD, last modified 8 May, 2014, http://www.webmd.com/sleep-disorders/living-with-insomnia-11/slideshow-insomnia. 6 “Overview of Insomnia,” Web MD. 7 Vasant Lad, Textbook of Ayurveda Volume 1: Fundamental Principles of Ayurveda (Albuquerque: The Ayurvedic Press, 2002), 283. 8 “Insomnia Myths and Facts.” Web MD. 10 Claudia Welch, Balance Your Hormones, Balance Your Life: Achieving Optimal Health and Wellness through Ayurveda, Chinese Medicine, and Western Science (Cambridge: Da Capo Press, 2011), 3.